ACE Inhibitors Pharmacology | All the Facts in One Place! ACE inhibitors are among the most widely prescribed cardiovascular medicines. Hypertension – ACE inhibitors reduce the risk of serious cardiovascular events, such as heart attack and stroke. They may be used first or second-line, usually in combination with another drug. Ischemic heart disease – as with hypertension, the purpose of ACE inhibitors is to reduce the risk of heart attack and stroke. Chronic heart failure – used for the symptomatic treatment of heart failure, improving overall prognosis for the patient. Diabetic nephropathy – ACE inhibitors can be used to prevent nephropathy from progressing in diabetic patients. They may also be used for chronic kidney disease (with proteinuria) to reduce proteinuria levels. ACE inhibitors are, then, an important class of cardiovascular medicines that play a significant clinical role in hypertension, heart disease and kidney complications. How do ACE inhibitors work though? The fundamental mechanism of ACE inhibitors pharmacology involves blocking the effects of ACE – “angiotensin-converting enzyme”. The ACE enzyme is predominantly found on the surface of pulmonary and renal epithelia. This enzyme is responsible for converting angiotensin I (ATI) to angiotensin II (ATII). Angiotensin I is itself produced from angiotensinogen, a globular protein released from the liver in response to renin release from the kidney. Renin cleaves angiotensinogen into ATI. Why is reducing angiotensin II levels important? ATII stimulates the release of aldosterone from the adrenal gland cortex. In turn, aldosterone promotes reabsorption of sodium and chloride ions, increasing water retention. During this process, potassium is also excreted. ADH secretion from the posterior lobe of the pituitary gland, promoting water retention from the collecting duct. Prevent aldosterone release from the adrenal cortex. Elimination of sodium ions (and increased water loss) from the kidneys. Consequent reduction in blood volume and blood pressure. ACE inhibitors pharmacology is dependent upon the cessation in production of ATII to reduce blood volume, blood pressure and halt diabetic nephropathy. Hypotension – a notable consequence of its mechanism of action. Patients typically experience worsened hypotension during the first dose, the effect tapering off thereafter. Persistent, dry cough – attributable to the accumulation of kinins in the lung. If the cough becomes too troublesome, the patient may be switched to an angiotensin-receptor blocker (ARB) instead – examples include losartan and candesartan. Hyperkalemia – as we learned from their mechanism, ACE inhibitors promote retention of potassium ions. Patient potassium levels should be monitored. Other potential side effects include headache, dizziness, fatigue and nausea. That ACE inhibitors should be used with caution in patients with renal impairment. Examples of renal impairment include renal artery stenosis and acute kidney injury. For chronic kidney disease lower doses should be used, and their effects monitored closely. ACE inhibitors are classified as pregnancy category D, meaning there is a positive evidence of risk. Due caution should be taken when prescribing ACE inhibitors with other medicines that increase potassium levels – potassium supplements; potassium-sparing diuretics such as amiloride and spironolactone. Due to first-dose hypotension, care should be taken when ACE inhibitors are co-prescribed with other hypotensive-producing agents. To reduce risk, first-dose is preferentially administered before bed. Risk of renal failure increases when ACE inhibitors are taken with NSAIDs. ACE inhibitors can have a transformative impact on patients with hypertension, heart disease and diabetic nephropathy. Their use continues to grow in an era where cardiovascular disease and obesity become ever more prevalent. 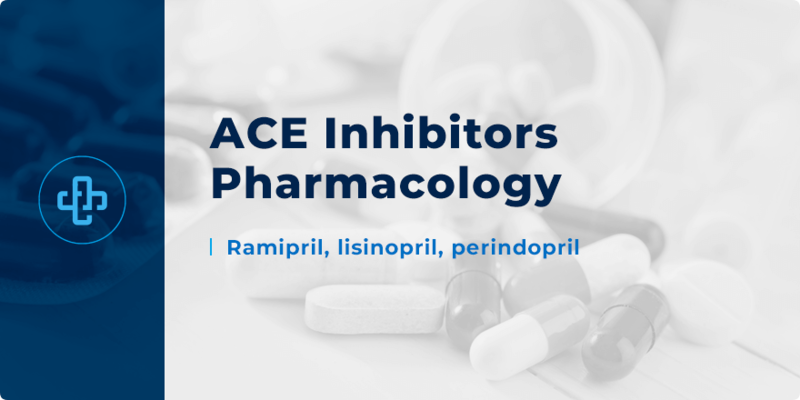 Want to test your knowledge of ACE inhibitors pharmacology? Register with PharmaFactz today to receive instant access to some great quiz questions. In the meantime, join our newsletter (above) to receive all the latest facts direct to your email!